If you were there, we hope you enjoyed it as much as we did. If you had to miss it, we hope you can make it to our next Eclipse community event. If you attended ESE 2010, please take our short survey. 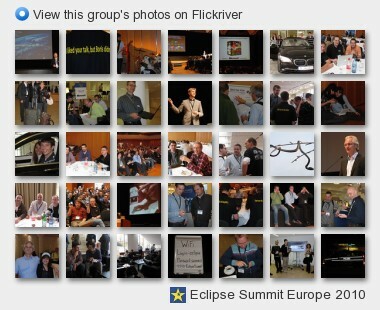 If you have a suggestion for a keynote for ESE 2011, please send email to ralph.mueller_at_eclipse.org. Thanks! EclipseCon 2011 preparations are well under way! The Call for Papers has gone out, registration is open, and the program committee is preparing another amazing selection of tutorials and technical talks to go along with the keynote presentations, receptions, and networking opportunities. Plan to join us March 21-24, 2011, at the Hyatt in Santa Clara, California. Upload your ESE photos to the Flickr group. Group membership is open to everyone!